A Hamas terrorist delegation arrived in Iran Monday to discuss repairing ties - strained as a result of Syrian civil war. A delegation from the terrorist organization Hamas which controls Gaza arrived on Monday for talks with Iranian officials on repairing ties between the two, local media reported. Tasnim news agency said the team was led by Hamas political bureau member Mohammed Nasr and included Osama Hamdan, who is in charge of international relations. Iran has been a key source of funds and weapons for Hamas. The visit is aimed at clearing the way for a "mission" by Hamas politburo chief Khaled Mashaal to Iran, Amir Mousavi, the head of Tehran's Center of Strategic Research, said on the website of the Hamas-linked daily Al-Ressalah. 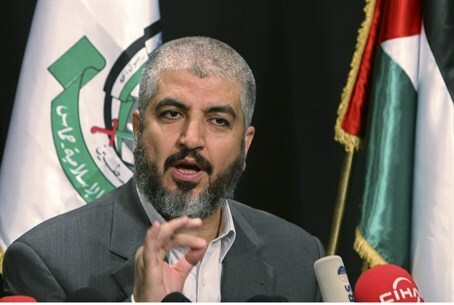 In October, Izzat al-Rishak, a member of Hamas leadership, issued a statement denying Hamas reports that Mashaal was expected to visit Iran in the near future. The Syrian conflict has strained the relationship between Hamas and Iran, with the Sunni Muslim Gaza-based group breaking ties with Damascus while Shi'i'te Tehran has remained a strong ally of the regime. Mashaal, in an interview with AFP in August, acknowledged differences over Syria but said their common enmity against Israel was a uniting factor. Iranian Supreme Leader Ayatollah Ali Khamenei has repeatedly called for Israel's annihilation. In October he bashed Israel for being "crueler than ISIS (Islamic State)" and accused the country of having "no limit or boundaries regarding viciousness, cruelty, and trampling underfoot all human standards and ethnics." Iran is known to be one of the main providers of equipment, funding and weaponry for Hamas and Islamic Jihad terrorists in their efforts to destroy the Jewish state. Islamic Jihad chief Ramadan Abdullah Shallah, during a visit to Tehran in October, praised Iran for its role during the recent Israel-Gaza conflict last summer. The 50-day war between Israel and terrorists in Gaza resulted in the deaths of about 2,200 Gazan Arabs, around 49% of them terrorists, and 73 Israelis, the majority of them soldiers. An icy ceasefire was declared on August 26.